Clefts of the lip and palate fall into two distinct patterns: clefts of the lip and, separately, clefts of the palate which may have an associated cleft of the lip. 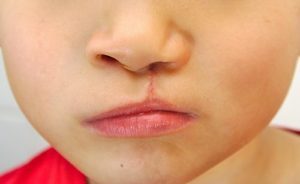 Whereas clefts of the lip are relatively benign, albeit unsightly deformities, clefts of the palate can affect functions such as eating, swallowing, hearing and speech. Palatal clefts are also seen as part of over 150 recognized syndromes ( Syndromes are specific congenital abnormalities, each of which combines a specific pattern or constellation of anomalies. For example, Down Syndrome, caused by a partial duplication of chromosome 21, has features of a large tongue, a transverse palmar crease, almond-shaped eyes, an epicanthic fold of the upper eyelid, impairment of cognitive abilities and physical growth and poor muscle tone.) Clefts are usually just off the midline and may be unilateral or bilateral. In New Zealand, clefts occur at the rate of about 1.4 per 1000 live births. Because clefts involve a number of bodily systems, such as feeding, hearing, speech production, swallowing and so on, primary clefts are best managed in a multi-disciplinary team setting, where at each clinic visit, the patient can be seen by experts in Plastic and ENTsurgery, speech-language production and managing feeding problems. Such cleft care teams and their services, such as Cleft surgery are available in Public Hospitals in Dunedin, Christchurch, Wellington and Auckland. Cleft repairs are usually undertaken in a fairly set sequence, with lip repairs at around 3 months of age and primary palate repairs at 9-15 months of age. These protocols will vary from centre to centre and from country to country. Unfortunately, as with all public health Care services, patients are subject to the iniquities of a waiting list. Some primary procedures and all secondary cleft surgery can be undertaken at any time and there are a host of procedures available, from operations designed to improve the quality of the voice, to procedures designed to correct typical aesthetic issues, such as the characteristic nasal deformity or scarring from primary lip repairs. All these procedures are available in the private sector and our surgeons at APSC are experts in this type of surgery. They would be happy to discuss your concerns. The newborn infant’s skull is ingeniously designed; it comprises several plates of bone, which interlock along seams called cranial sutures. This design allows for the head to be compressed and moulded during the rigorous passage down the mother’s birth canal, and after delivery, as the rapidly expanding brain exerts outward pressure, the skull enlarges, by growth along and at right angles to the sutures. Failure of growth along these sutures leads to a condition known in general as “Craniosynostosis”. A number of syndromic and non-syndromic conditions can result in failure of growth at areas along these sutures, and depending on which sutures are involved, characteristic deformities of the skull can result. This condition results from premature fusion, or inadequate growth along the midline or sagittal suture, which runs from front to back along the top of the skull. Because there is no side to side growth, these skulls are long and narrow. This condition is caused by premature fusion or inadequate growth across the coronal sutures, which run from the “soft spot” on the top of the baby’s head, down into the temples on either side. In Classic brachycephaly, both left and right coronal sutures are involved. This characteristic deformity is quite common nowadays, due to infants being placed on their backs to sleep. The newborn skull is very soft and easily deformed and if the child has a favoured position with the head turned to one side or the other, a characteristic flattening of the back of the skull, with the same side ear and forehead being pushed forward, can develop. This is “Positional Plagiocephaly” and providing it is detected early, can be treated by simple positioning strategies.More significant is the unilateral fusion of one coronal or (very rarely) one lambdoid (posterior skull) suture. This produces a typical obliquity of the skull which requires craniofacial surgical intervention. This is thought to be due to premature fusion of a midline suture in the frontonasal/forehead region. It produces inadequate growth across the forehead and hence a characteristic triangular deformity of the front of the head. Again, this is treated by Craniofacial surgical intervention. This is a congenital condition characterized by multi-sutural synostosis or fusion. For most patients, significant improvements can be achieved by a fronto-facial advancement and cranial vault remodelling before 1 year of age. This condition is characterized by multi-sutural synostosis, a typically short, brachycephalic skull, often with a very high forehead; an increased distance between the eyes (hypertelorism) and often, significant involvement of the hands and even the feet with a bony and soft fusion between the digits (complex syndactyly). Each case is managed on its merits but may require both cranial vault remodelling, fronto-facial advancement and correction of the hypertelorism. Craniofacial surgical intervention may need to be staged or even repeated. The hands are also managed surgically, usually at a few years of age. This is an extremely rare condition in which there is relative undergrowth and under-development of the central midface, affecting the nose and the upper jaw. Patients may present with a flat, small nose and a reverse overbite, with a relatively protuberant lower jaw. Symptoms, apart from the characteristic appearance, may include nasal airway obstruction, snoring, speech defects and anomalies of the cervical spinal vertebrae. The disease may have a familial basis but is usually sporadic. Treatment involves surgery and there are various techniques described, depending on the problem to be addressed and its severity. This condition, which is usually bilateral, but may be bilateral, is the second most common congenital anomaly after clefts of the lip and palate. It is focused on abnormalities of the ear, jawbone and mouth and affects the lower lateral portion of the face. Current suggestions as to causation include the theory that there is an interruption of the blood supply top key structures around the temporo-mandibula joint, around 4 weeks of gestation. This may or may not be hereditary, but the net effect is to restrict the developmental potential of this area of the face. Severity ranges from mild, with just the ear being affected (microtia, (small ear) or an absent ear ( anotia), to significant portions of the face, the eye and parts of the body being affected. Treatment and its timing will depend on what structures are affected and what techniques are selected for correction. For example, in former times, children were allowed to grow to skeletal maturity before a reconstruction, usually using a rib graft, was attempted, to correct an underdeveloped mandible; nowadays, in infancy, osteogenic distraction techniques can be employed to lengthen and shape an underdeveloped jawbone so that it keeps pace with the normal side. This congenital anomaly is very variable in its presentation, from almost unnoticeably mild, to very severe. Although usually autosomal dominant in its inheritance, it can also arise from a spontaneous mutation. The fault is believed to lie on chromosome 5q32-q33, which fails to encode a specific protein termed “Treacle”. The end result is midface hypoplasia or underdevelopment of the facial bones, leading to a characteristic facial appearance with a very small jaw ( micrognathia) and a prominent nose. There may be down-slanting eyes and a notch in the lower eyelid, termed a coloboma. The ears may likewise be very small ( microtia). Almost all of the presenting features are amenable to surgical improvement, if not complete correction. Just like any other part of the body, the hands, which are very highly developed in humans, may be subject to congenital anomalies, or derangements of development. In this condition, there are more toes, fingers or thumbs than normal. This may present as a small nubbin of tissue which can be simply removed. More commonly it is a separate structure with bones and joints and on rarer occasions, it may be a supernumerary, fully functioning digit. Polydactyly may arise because of a defect in a single gene, or as part of one of a number of syndromes.The treatment is usually surgical removal, most commonly in early childhood. This is a condition in which two or more adjacent digits, fingers or toes, are fused together. If the fusion involves soft tissue only, it is a simple syndactyly, but if there is bone involved, the syndactyly is said to be complex.There are genetic defects associated with specific sites on chromosomes 2, 6 and 7 which can lead to five different types of syndactyly. These may be isolated anomalies or can occur as part of syndromes such as Greig’s acrocephalosyndactyly, or Apert’s syndrome. Treatment involves separating the fused digits, often with the use of skin grafts, in infancy. Even in the more severe “rosebud” complex syndactylies seen in Apert’s syndrome, in which there may be absent bones and joints, there is often a remarkable degree of functional recovery in the involved hands.